How to Solve iTunes Won't Sync Photos to iPhone/iPad from Mac/PC? How to Solve iTunes Won't Sync Photos to iPhone/iPad from Computer? Do you have gigabytes of photos on computer that need syncing to iPhone iPad through iTunes, however, your iTunes Sync Photos function is not working at present? The reason to iTunes won't sync photos varies, and the solution is also diverse. Therefore, this article will focus on why and how to solve iTunes not syncing photos to iPhone iPad from different aspects. How to Transfer Photos from Computer to iPhone iPad without iTunes? iTunes Sync Photos not working, how to transfer photos to iPhone iPad from computer? DearMob iPhone Manager is the best iTunes alternative that you can use to bulk or selectively sync pictures from computer to iOS, as well as sync music/videos/TV shows and backup iOS with encryption. 1. iTunes shows "Preparing to copy" and then it will just stop continue further syncing. 2. iTunes just gets stuck with the message "Reading photos from Pictures". 3. iTunes shows no photos when trying to choose a folder to sync despite that there are photos on computer. 4. iTunes not syncing all photos or albums, only part of contents are synced to iPhone or iPad. 5. After updating iOS, iTunes displays an alert that there is not enough room to sync photos. 6. The error shows "Some of your photos, including the photo '[photo name], were not copied to the iPhone '[device name]' because they cannot be displayed on your iPhone." 7. The error appears "iTunes cannot sync photos to the iPhone 'name' because your Photos Library is not yet available. Please try again later." The iTunes won't sync photos problem has been mentioned again and again in the forums. Some people have got the workarounds, while others are still wandering as Apple will no longer update the corresponding solutions officially. If you have checked that your USB, USB port, computer firewall and anti-virus software are in right condition, and iTunes won't recognize iPhone iPad doesn't happen, the method below may give you some helps. How to Solve iTunes not Syncing Photos to iPhone iPad? Make sure that the iCloud Photo Library on your iPhone or iPad is not turned on. When iCloud Photos is turned on, iTunes Sync Photos won't work and photos can be downloaded from computer to iPhone wirelessly without the need of iTunes. Make sure that there is enough storage space on your iPhone or iPad to save the synced photos. Open iTunes, and click the "Help" menu at the top of the iTunes screen. Click "Check for Updates" on the sub-menu to check for the latest iTunes for Windows 10/8/7 on your PC. On a Mac, click the "iTunes" menu at the top of the screen, and click on "Check for Updates" on the sub menu. Alternatively, you can download the latest version of iTunes on Apple official site. Advisably, you are suggested to uninstall all the Apple components on Windows before reinstallation including Apple Application Support, Apple Mobile Device Support, Apple Software Update and Bonjour. Some people have complained that their iTunes won't sync photos though they did nothing to their iTunes or computer except updating the iOS. iOS 11 is to blame that most users think. So, if you did nothing but changed your iOS, you could try to upgrade or downgrade the iOS to see if it works. iTunes does support GIF/PNG/JPEG/JPG/TIFF syncing from computer to iPhone iPad, however, all the formats will be automatically converted to JPG during syncing, and thus the GIF images will lose animated effects. If you want to keep the animated GIF photos on iPhone iPad, you'd better choose DearMob iPhone Manager to transfer photos from computer to iPhone. Besides, after testing, iTunes won't sync some photos in BMP to iPhone iPad though Apple says it can. When the "Selected folders" in iTunes Photos tab gets grey, you are only allowed to check "All folders" and choose folder from the drop down menu of "Copy photos from" to find the one on computer you want to sync. If you want to see the folders in iTunes, you can click on "Choose folder…" from the drop down menu of "Copy photos from:" > click on the drop down arrow besides 'Pictures' > select 'My Pictures' > click on 'Select Folder', and then you will see all the sub-folders. Choose one or more folders to sync with iTunes. When iTunes fails to sync photos on Mac, the common error is "iTunes cannot sync photos to the iPhone/iPad 'name' because your Photos Library is not yet available. Please try again later." To solve this iTunes not syncing photos to iPhone/iPad issue, please follow the below checklist. * The message "not available" suggests that the Photo Library is in use by another process, iTunes can only sync from the System Photo Library, so you should make it your System Photo Library by opening Photos > Preferences > General > select "Use as System Photo Library". Then, restart your Mac and try to use iTunes Sync Photos. * Make sure the Photo Library is accessible and readable. * The version of iTunes you are using needs to match the version of macOS. If you are using macOS Mojave, you need to update your iTunes to the version compatible with Mojave. How to Sync Photos from Computer to iPhone iPad without iTunes? As Apple had officially said it will no long update the page https://support.apple.com/en-us/HT204545 about iTunes won't sync photos, you won't found any official solutions. It is obviously that Apple is trying to push you to use iCloud to sync photos, however, iCloud is not that ideal regarding the needing of internet and different paid plans. 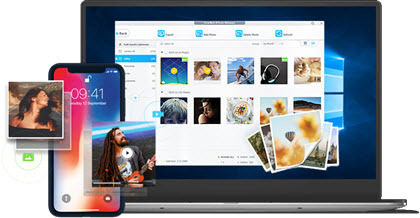 If you want to find a perfect iTunes alternative when iTunes Sync Photos is not working, DearMob iPhone Manager is what you are looking for to transfer photos from computer to iPhone without iTunes. It is a professional iOS data backup transfer tool that is compatible with iOS photos, music, videos, contacts, messages, apps and more. To transfer photos, DearMob iPhone Manager offers you the easiest steps without iTunes. Step 2. USB-connect iPhone to your computer, tap Trust on your iPhone/iPad to continue if it asks. Step 3. Click on Photo Transfer icon on the main UI of DearMob iPhone Manager, and create a new album by clicking on the "+" in the left bar. Step 4. After creating the new album, click on "Add Photo" on the top bar to choose photos or photo folder to transfer from computer. Step 5. After adding, hit the Sync button at the bottom right corner. Then, DearMob iPhone Manager will immediately sync photos from computer to iPhone iPad without quality loss. 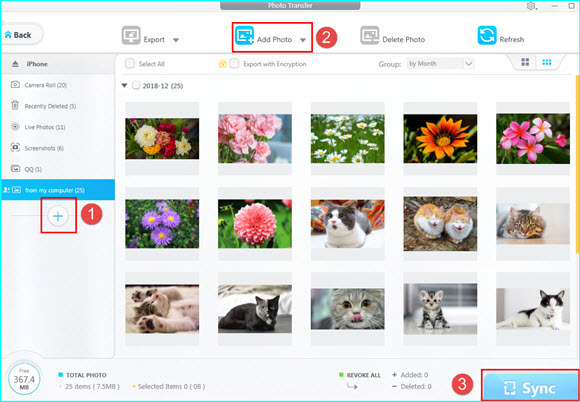 DearMob iPhone Manager offers bidirectional sync methods that you can also use it to export iOS photos to Windows/Mac selectively or in bulk for backup with encryption. Or, delete synced photos from iTunes to free up the space, convert HEIC o JPG, and turn Live Photo into still.